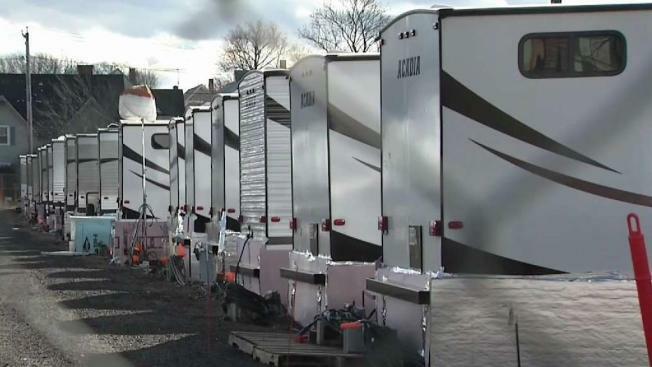 The Massachusetts Emergency Management Agency plans to shutter six temporary trailer sites across the Merrimack Valley, a move that could force more than two dozen families to move into hotels or apartments. “We just felt like the travel trailers in the long term in the middle of a New England winter wouldn’t be ideal,” said North Andover Town Manager Andrew Maylor. Maylor, who announced his intention to ask MEMA to close the sites after pipes froze in nearly two dozen trailers in November, said the closures may force some residents to move into either an apartment or a hotel. Maylor also said the trailers caused about $500,000 in damage to one of the town’s fields. He said he expects Columbia Gas to reimburse the town for repair costs. In October, 360 trailers were delivered to six sites across the region. Only 27 trailers remain occupied. Columbia Gas said it is 93 percent finished with restoring gas service to about 8,000 customers. The company’s self-imposed deadline to finish the work is Dec. 16.